The East Range is still giving up its secrets. 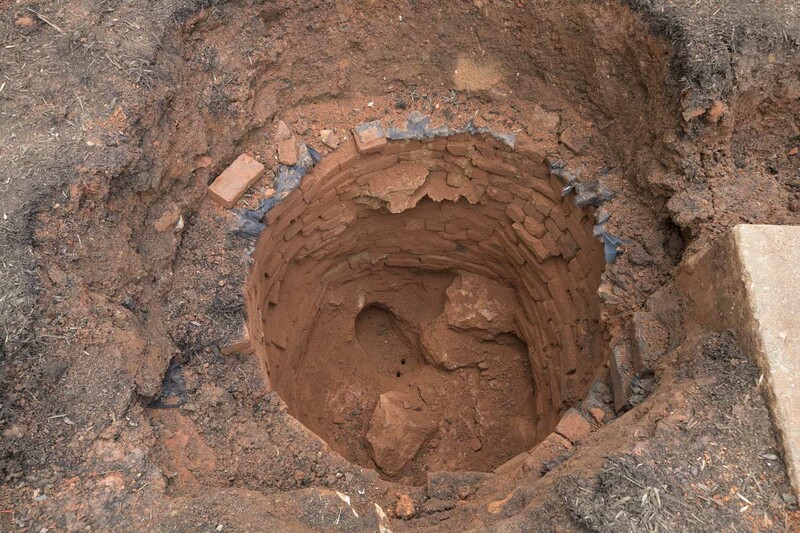 Archaeological excavations during the past year have exposed an early well, revealed more about how enslaved African-Americans lived during the early years of the University of Virginia, and how the University’s hotels operated. The archaeology work was conducted in anticipation of a stormwater drainage project, which will install drains and detention structures to capture runoff. The land east of the Lawn slopes steeply downward and has always had drainage issues. Sarita Herman, a project manager for UVA’s Division of Facilities Management, said that workers will install pipes underneath the alley road surfaces on the East Range and will add curbs to the alleys to help manage stormwater. In preparation for the drainage excavation, Rivanna Archaeological Services explored several areas on the East Range – part of the Thomas Jefferson-designed Academical Village, which dates back to the early 19th century – including a well next to Pavilion IV, underneath what had been some boxwood plantings. There, archaeologists found a round, brick-lined hole, about four feet in diameter. While initially uncertain of its purpose, they believe it to be the first well to be located on Grounds. 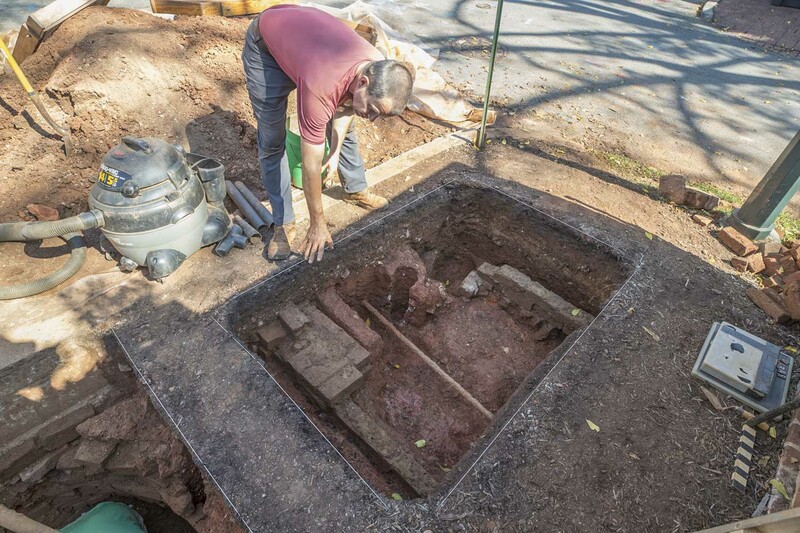 “We’ve found cisterns and wooden water pipes, but this is the first well,” archaeologist Benjamin Ford of Rivanna Archaeological Services said. He said documentary evidence has been found that supports the idea of a well at that site. A notation in Proctor Arthur S. Brockenbrough’s papers indicates that pump contractor Andrew Ziegler presented a bill on Dec. 28, 1833, for $17 for the repair of a pump near Pavilion IV, with the services including cleaning the well and replacing 16 feet of wooden pipe. In excavating the well, Ford and his crew dug about 4 ½ feet before striking rocks. The well was later vacuumed out to about 7 ½ feet below the current grade. After encountering larger rocks, workers filled in the hole with sand and covered it over. There was a structure on top of the well’s location, which may have been built to protect the well or it may have been built after the well was decommissioned and filled in, Ford said. It is currently unknown when the well was closed and filled, he added. The earliest map of the Grounds that contains an image of the structure over the well is from the 1870s. Ford said that an 1856 map by Charlee Ellet and an 1858 map by William A. Pratt do not show the building, but since these maps tended not to include dependencies and outbuildings, the building may have been unrecorded. Along with Facilities Management staff, archaeologists also explored a closed 26-foot-by-14-foot room underneath the dormitory rooms south of, and adjacent to, Hotel D.
University masons working on the exterior of the basement wall first identified the nearly inaccessible room. The room had a blocked northern doorway that formerly linked it with the basement level of Hotel D. Two small windows allowed air and light to enter the space. One of the windows had been bricked up, and the other has been used as an access hatch into the space for many years. The room contained a dry laid-brick floor. He said the room could have been used as a pantry, an ancillary work space or a dining area. He said the room was barren except for a brick stack that supported a chimney for the upstairs rooms. The room itself had been whitewashed, a technique often used to brighten rooms with limited window openings. Ford said he does not think sealing the door was due to an entrance issue, but may have been more of a question of trying to keep moisture out of the building. Ford said that while research to date cannot verify if enslaved African-Americans lived in the room, it is a strong likelihood that they worked and lived in the space. In Jefferson’s original design, the hotels had kitchens in the basement, and some of the basement space may have been used as residential space for slaves. The rediscovery of this room continues to add to the information documenting slavery on the Grounds. Further research may help fill out the picture, he said. The kitchens’ location in the basements of the hotels tended to lead to drainage problems. Ford cited John B. Richeson, keeper of Hotel B, who wrote to the Board of Visitors in October 1826 complaining about water in the hotel. “I conceive it to be a duty I owe to this Institution and to myself, to report to you in some way, the situation of the tenement I occupy,” Richeson wrote. “The cellar to my Hotel is five feet below the surface of the earth: around it is a brick wall four feet off, to give light and air through the cellar windows – Whenever we have a heavy rain, a great deal of water falls between this wall and the cellar, and in consequence of there being no drain to let it off, the cellar floors are frequently covered with water; and on one occasion since my residence here, the floor during a heavy fall of rain were shoe deep in water! Everyone must be sensible that this makes the kitchen on such occasions, which is the cellar, almost impracticable at the time to cook in, and in a great degree contributes to make my family sickly. A large drain to let off this water, would in a great measure, keep the cellar floors dry [sic]." A partial solution to Richeson’s dilemma may have been to build a kitchen in a dependency behind Hotel B, the floor of which was partially uncovered in the summer of 2017 next to the easternmost wall of Pavilion II’s garden. Ford said he knew the approximate location of the dependency from a 1960s map of the garden. Archaeologists opened an approximately 5-foot-by-5-foot unit in the location of the former dependency, exposing a dry-laid brick floor atop of a thin bedding of sand. Much of the original floor exposed in the unit was damaged by excavation associated with 1960s-era construction of a garden wall. “The area was mechanically excavated and there were tooth-marks on the brick from the bucket loader,” Ford said. As identified in the 1960s, the original structure would have been approximately 18-feet-by-12-feet, with an east/west orientation. Constructed in the 1830s, Ford said, it apparently survived until the 1920s, when it was last recorded on University maps. Ford said that while only basic information can be gleaned from the presence of the brick floor in in the Hotel B kitchen dependency, the materials, construction and location of this structure appear to conform with other archaeologically identified structures of this type, commonly a story-and-a-half with work space in the first floor and living space in a dormer. Ford said he is pleased that there are still things to find in the ground on the Grounds.